A space suit is a garment worn to keep a human alive in the harsh environment of outer space, vacuum and temperature extremes. Space suits are often worn inside spacecraft as a safety precaution in case of loss of cabin pressure, and are necessary for extravehicular activity (EVA), work done outside spacecraft. Space suits have been worn for such work in Earth orbit, on the surface of the Moon. Normally it is used as a protective wear. Fly higher and higher, the air becomes thinner, so they need air to breathe and to support their bodies. The earliest suits were made of rubber and cloth and were stiff, bulky and hard to move around in. In the 1950s and 1960s, Russia and America got into a race to be the first into space. Although the earliest astronauts stayed inside their spacecraft, scientists knew they needed protection, and so started work on better space suits for these missions. The first NASA spacesuits were silver in color, because scientists thought this would reflect the burning hot sun rays. They had hoses on them that were attached to machines that kept them supplied with air and cooling water. The picture on the left shows the first seven NASA astronauts, selected from the best Air force test pilots, to fly on the Mercury space missions that put the first Americans into space. 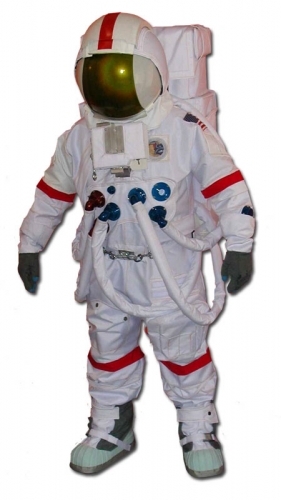 The first knitted space suit was designed by the collaboration of NASA, Nike, and USAID & US department of state. It was designed in 2010 and launched in 2013 especially for the exploration of mars. 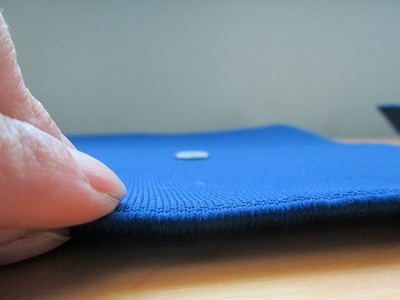 Flat knitting was used for producing samples of spacer fabric by using different yarn for different purposes like Kevlar, silicon, carbon, spectra etc. 5+ layers are used for making this suit. Each suit panel is comprised of non-terminating yarns. The support areas of the fabric consist of several textile stitch areas of gradient levels of stretch elements, flex, rigid, and restrictive elements, which are integrated into the fabric by mapping the appropriate levels of motion or protection required. These knit stitching techniques create varying degrees of elasticity, rigidity, open channels, tunnels, and zones of specialized yarns integrated into the base fabric. Zones are comprised of threads or yarns, which are isolated into specialized needs, using Kevlar, monofilaments, Spectra, silicon, or other specialty performance yarns knit into the fabric to enable that region to perform a combined protective, biomechanical range of motion, compression, and therapeutic element integrated into that single panel, or series of panels required completing a garment. One of several concepts in Fabdesigns, Inc. submission to LAUNCH 2013 plans to address Space Adaptation Sickness (SAS) and muscle loss. It utilizes electro stimulation, with current applied, and sensors receiving data much like the function of knitted brace supports and some high tech wet suits currently on the market. This compressive garment combats lack of gravity by: increasing circulation and venous blood flow, delays exhaustion and muscle soreness, optimizes endurance, helps the body remove lactic acid faster, improves strength and power, and encourages positive posture like an orthopedic training garment. On Earth radiation is a danger faced by the military, health care workers, and the first-responder in many different scenarios. Like it or not, this world is becoming more challenging with pollution, disasters like the Fukushima Daiichi Plant, and horribly creative terrorist situations that none of us want to imagine, but are none the less real. Our anatomically correct applications addressing protection as well as comfort, will reach the people who need it much faster as extreme career wear, in military, medical, energy, transportation, safety, protection and first responders.